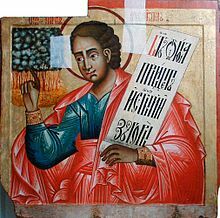 An 18t-century Roushie icon o the prophet Habakkuk (Iconostasis o Transfeeguration Kirk, Kizhi monastery, Karelie, Roushie). Habakkuk[lower-alpha 1] wis a prophet in the Ebreu Bible, descrived in the Beuk o Habakkuk. This page wis last eeditit on 4 November 2018, at 06:07.